A reliable source for Portable Industrial Vacuums information and a resource for accessing leading Portable Industrial Vacuums and suppliers. Portable industrial vacuums are industrial vacuum systems that you can move around in order to pinpoint specific areas that require cleaning. Portable industrial vacuum cleaners are not to be confused with domestic vacuum cleaners, which are portable but can only do surface level or just below the surface level work. 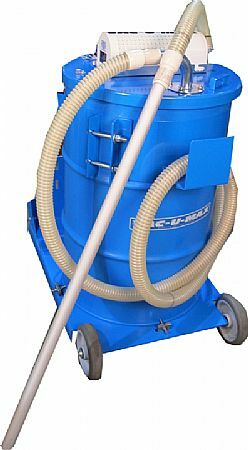 Instead, portable industrial vacuum cleaners focus on severe duty applications. Portable Industrial Vacuums Portable industrial vacuums are industrial vacuum systems that you can move around in order to pinpoint specific areas that require cleaning. Portable industrial vacuum cleaners are not to be confused with domestic vacuum cleaners, which are portable but can only do surface level or just below the surface level work. Generally, industrial portable vacuum cleaners have six main parts: a filtering system, a fan, a motor (electric, gas, pneumatic or powered by a separate vehicle), an inlet port, an outlet port (exhaust port) and a housing that holds it all inside. Fans create the pressure imbalance the vacuum requires to pull in the air and material outside. The housing, sometimes called the tank, is typically built from stainless steel, which is strong, impact resistant, corrosion resistant and abrasion resistant, among other things. Based on your applications, manufacturers can customize portable industrial vacuums by size, capability and other design elements. One common modification is the inclusion of HEPA filters, which can efficiently capture extremely small particles. Other modifications include the inclusion of hose attachments for standing water removal and the inclusion agitators for deep stain removal. In addition, some portable industrial vacuums are trailer or truck mounted. This permits not only efficient portability, but also allows user to couple the vacuum system with truck/dumpster loading and unloading systems or even conveying systems. Portable industrial vacuums offer a host of benefits. Most obviously, they can go places where stationary vacuum systems cannot, including remote locations. Likewise, they are adaptable and can be adjusted or updated with new attachments for new applications. Third, if something goes wrong, you can more easily get portable vacuums serviced than stationary ones. Furthermore, you can easily swap one machine out for another while it is getting fixed. You cannot do this with stationary vacuum systems. Finally, portable industrial vacuums are durable and long lasting.